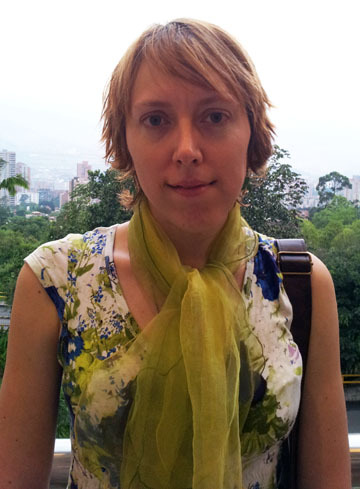 Dr. Polina Golovátina-Mora is an Associate Professor at the School of Social Sciences at Universidad Pontificia Bolivariana, in Medellín (Colombia). She is an instructor for the PhD Program in Social Sciences and a Faculty Affiliate at the MA in Learning and Teaching Processes in Second Languages. Her current teaching duties focus on introduction to epistemology and graduate seminars on language, culture, and power. She has been a lecturer and visiting professor at universities in Russia, Czech Republic, and Colombia. She has also been a visiting researcher at the University of California-Berkeley and the University of Illinois at Urbana-Champaign. Dr. Golovátina-Mora has a doctoral degree in history (Urals Federal University) and a master’s degree in Russian and Eastern European Studies (University of Illinois at Urbana-Champaign), the latter as a Fulbright Scholar. She was an Erasmus Mundus Postdoctoral Fellow at the Pultusk Academy of Humanities in Poland. Dr. Golovátina-Mora’s scholarship ranges across different languages and topics. A multilingual writer, she has published and presented her work in English, Russian, Polish, Czech, and most recently, Spanish. Her work includes articles and book chapters on historiography, representations of social processes (collective memory and identity construction, responses to the social structures and pressures). She has presented her work, including conference presentations, plenaries, and invited talks, in Colombia, the United States, Poland, Czech Republic, Finland, Turkey, Russia, Germany, and Italy. Her most recent research features narrative inquiry and discourse analysis studies on monstrous theory and how fear is constructed in contemporary cities and societies and through popular culture (especially in light of the renaissance of the vampire genre). Recent work (along with her husband, Dr. Raúl A. Mora) includes discussions of social and curricular constructions of bilingualism and multiculturalism and the use of Bourdieusian frameworks to analyze culture. You can find out more about Dr. Golovátina-Mora’s scholarship through her website and her Academia.edu profile. Languages for presentation: English, Castilian. The primary focus for the 7th edition of this inclusive and interdisciplinary annual conference organized by Enkidu Magazine and the International Society for Cultural History and Cultural Studies (CHiCS) in Mexico City with the support of the National Human Rights Commission of Mexico, is to interrogate storytelling, memories and identity constructions from a wide range of perspectives, and in their manifold cultural and social manifestations. We welcome submissions from all branches of the social sciences, humanities, as well as the arts. Interpretations of the conference themes ranging from the predictable to the surprising are encouraged. Interdisciplinary perspectives are especially welcome since all these topics in themselves stretch across several disciplines: history, literary studies, linguistics, psychology, political sciences, educational sciences, ethnology, queer studies, anthropology, sociology… Graduate students are encouraged to participate. The conference has developed into a unique international academic forum for interpretative approaches in the humanities and social sciences. The conference has traditionally also been a forum for discussing creative historical and political memory, remembering and forgetting of the past, as well as translations between cultures and re-negotiations and re-constructions of cultural identities in one one way or another. The conference is organised into a large number of thematic sessions and sub-conferences addressing a highly diverse series of themes. The conference has an exceptional multilingual and multi-cultural approach, typically bringing together participants from all over the world to share and exchange their research, experiences and ideas in a truly multicultural, multilingual and interdisciplinary academic environment. The conference sessions are conducted in Castillian and English. Occasionally, the conference also has sessions conducted in German and French. Some sessions will be bilingual and conducted in both languages with interpreters (on request). Other sessions will be conducted in one of the two conference languages, and the session moderator will give summaries of the paper in the other language. Many sessions are being conducted with interpreters for sign language (on request). Papers are welcomed on virtually all related topics and themes, independently of time period and space. Also papers of comparative phenomena will be considered. Interdisciplinary perspectives are encouraged. The conference aims at bringing together academics working in all relevant disciplines as well as activists, artists and other professionals, and promoting innovative multidisciplinary and multicultural exchange and dialogue. CHICS’ academic conferences are characterized by traditional paper presentations in panel sessions with three speakers each, followed by lively exchange, dialogue and interaction between speakers and audience in many small groups, workshops and seminars rather than by formal plenary sessions. Our conferences provide a forum for diverse voices from all over the world, to come together and make connections across linguistic, cultural and academic barriers. The conference languages for presentation will be English and Castilian. 500 word abstracts should be submitted to the organising committee in English, Castilian, German or French. Final papers should be of approximately 20 – 30 minutes duration (circa 8 – 10 pages). Other forms of presentation, for instance workshops, panel debates and poster sessions will be considered on request. Abstracts are to be submitted along with the presenter’s name, short bio, address, telephone, email, and institutional affiliation. It is recommended to use this form when submitting a paper proposal. However, abstracts will also be accepted as e-mail attachments. All correspondence for this conference will be conducted via email. You will be notified by 15. July whether your proposal has been accepted or rejected. Typically, a panel of academic papers should include 3 (maximum 4) speakers and 1 moderator (session chair). Each session will last for 2 hours allowing for 30 minutes for each speaker and a further 30 minutes for questions and discussion. Proposers should submit: (1) Session title and a session intro (ca 100 words), (2) Paper titles, (3) Abstracts for each paper (500 words), (4) Short biography for each participant and the panel chair (ca 100-150 words), (5) Institutional affiliation and address for each participant, (6) Audio-visual and other technical requirements. If you would like to propose a panel session, and want assistance in finding speakers and/or a session chair, we can publish a call for papers for your panel session on the conference web site and distribute it in our newsletter. If you have an idea for a thematic panel session and would like us to publish a call for papers on the conference website, please send us a proposal by e-mail. We acknowledge receipt and answer to all paper proposals submitted within few days. If you do not receive a reply from us in a week you should assume we did not receive your proposal; it might be lost in cyberspace! We suggest, then, to resend your abstract and resubmit your registration form, and if possible, suggest an alternative e-mail address. In particular delegates using hotmail or yahoo accounts to receive conference related e-mails often experience problems receiving conference information by e-mail. E-mails from the conference organisers are often delivered to your spam folder and not to your inbox, unless you remember to add the following e-mail addresses: huc@enkidumagazine.com and liowlb@enkidumagazine.com to your safe-list. The first address is the general e-mail address of the conference and will be used to send conference newsletters and general information. The second, is the e-mail address of the academic coordinator of the conference and will be used for individual communication with delegates. Artists are welcome to suggest exhibitions and displays of art during the conference. Organisations, universities and publishers are welcome to sign up for information stands at the conference center. Commercial exhibitors pay a modest daily fee. The following information is required by artists, publishers and other exhibitors during the conference: 1) Technical Description of the information stand or artwork with indications of technical requirements for their presentation, the size and extension of the individual artworks to be presented. 2) Estimated Insurance value of the artworks 3) One image of a representative sample of artistic work from the exhibitions can be sent by e-mail to the conference organizers in the format tiff or jpg. 4) Curriculum Vitae of artist (or organisation). 5) Description of Exhibition (300 – 500 words). 6) Short bio of artist (or organisation). The academic sessions with formal paper presentations will take place between 4 November and 9. November 2011. Before the conference, we will organise a number of cultural and social activities for conference delegates and we hope that many international delegates will consider arriving in Mexico City some days before the conference and participate in these activities. In addition conference delegates with name badges will be given discounts and sometimes free access to various theatre plays, concerts, film screenings and other events before and during the conference. The final program for the cultural and social pre-conference activities will be published on the conference web site and will be announced also in the conference newsletter, which will be distributed by e-mail in the months before the conference. We are pleased to announce that printed conference materials that will be distributed during the conference, also will be available in large print or Braille on request. If you require sign language interpretation during your session, or you would like to distribute handouts or other materials in Braille during your presentation, please indicate this in the registration form. Participants with disabilities are recommended to indicate this in the form if they require any special support or assistance during the event or during social and cultural activities before or during the conference. Payment received via PayPal or bank transfer in advance (Payments completed before 15 July. A suplement of 50 USD applies after this day and for payments on location). We recommend everyone to arrange their payment of the registration fee before the conference. On location, we have no possibility to process credit cards, nor issue official receipts and the registration desk will generally be staffed with volunteer students who are not entitled to receive payments in cash. If you for any reason prefer to pay on location in Mexico, please inform the organizers in advance, and we will find a solution for you. Enkidu and the participating organisations will not be able to provide travel support for conference delegates. It is therefore strongly recommended to apply for a scholarship or a grant from other sources. Delegates from non-OECD countries and students and unwaged delegates from any country who do not receive financial support to attend the conference, can apply for a reduced registration fee. A selection of papers will be considered for publication in an edited collection. Enquiries about the conference should be sent via email.